A QHS alum from the class of 1985, Kent joined the QPS Foundation in September of 2017 and brings over 20 years of marketing communications experience to the Foundation. 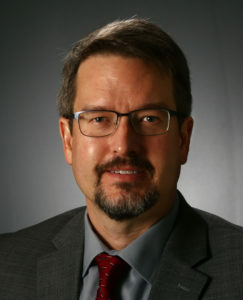 He received his BA from the University of Iowa in 1989 and has worked in graphics and marketing in various capacities across several industries. Prior to joining the Foundation, Kent was the Marketing Manager for The Salvation Army in Quincy for 7 years and helped launch the Kroc Center brand in 2011. He also serves on the Executive Board of the Mississippi Valley Council of Boy Scouts. Kent is married to Denise (Huntley) Embree (Class of ’86), and they have two sons, Evan and Garrett. Evan is an Eagle Scout and recently graduated from QHS in the class of 2017, and Garrett goes to QJHS. The Embree family has a love of the outdoors, Boy Scouting, marching band, and everything Blue Devil! A QHS alum from the class of 1989, Amy joined the QPS Foundation in May, 2018. She received her BA from Illinois State University in 1993. Amy has worked in marketing, sales and event planning while living in Quincy, St. Louis, Denver and Atlanta. She spent several years staying home with her 2 children, Emma, 16, and Dylan, 12. Amy is a lifetime member of the Quincy Service League.